The Ganges remains one of the most polluted rivers in the world, despite being a key lifeline for half a billion people in the South Asian subcontinent. In India, pollution in the river and problems with year-around flow have persisted despite decades of government initiatives. In 2014, the newly elected government of Prime Minister Narendra Modi launched a massive 200 billion rupee (US$2.9 billion) Namami Gange Program for “integrated conservation” of the river, also known as Ganga, with two main objectives: cleaning the river and ensuring year-around flow. Four years down the road, however, there has been little success in rejuvenating the ailing river. ISLAMABAD/WASHINGTON (Reuters) - President Donald Trump’s administration has quietly started cutting scores of Pakistani officers from coveted training and educational programs that have been a hallmark of bilateral military relations for more than a decade, U.S. officials say. The move, which has not been previously reported, is one of the first known impacts from Trump’s decision this year to suspend U.S. security assistance to Pakistan to compel it to crack down on Islamic militants. The Pentagon and the Pakistani military did not comment directly on the decision or the internal deliberations, but officials from both countries privately criticized the move. A cross-party group of 16 US senators has urged the Trump administration to block the International Monetary Fund (IMF) from bailing out the countries that have obtained loans from China under its infrastructure development plan. The letter to Secretary of State Michael Pompeo and Treasury Secretary Steve Mnuchin mentions Pakistan, Sri Lanka and Djibouti among the countries that have accepted billions of dollars in loans from China but are unable to repay. “We write to express our concern over bailout requests to the IMF by countries who have accepted predatory Chinese infrastructure financing,” the senators wrote. KABUL, Afghanistan — Afghan government forces lost more than 200 officers and soldiers in fighting over the past three days as Taliban insurgents launched sustained attacks on four different fronts. 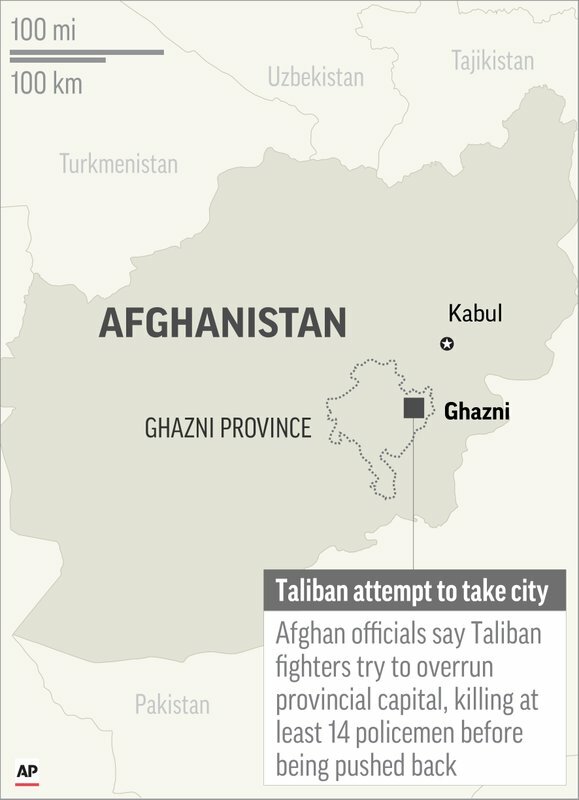 The hardest-hit area was the southeastern city of Ghazni, where more than 100 police officers and soldiers had been killed by Sunday, a hospital official said, and the insurgents appeared to be in control of most of the strategic city aside from a few important government facilities. Ninety miles west, in Ghazni Province, the Taliban seized control of the Ajristan District. The elite army commando unit that had been defending the district disappeared for two days, and their superiors were uncertain of their fate. When they found out on Sunday, estimates of the dead ranged from 40 to 100. Twenty-two survivors were carried to safety on donkeys by rescuers who found them lost in the mountains. In Faryab Province, 250 miles to the northwest, an isolated Afghan National Army base of 100 soldiers lost more than half of its men in a Taliban assault that ended early Sunday morning. The defenders said they did not expect to last another night. And 275 miles east of the Faryab base, in northern Baghlan Province, at a base at Jangal Bagh on the strategic highway between Pul-i-Kumri and Kunduz, insurgents killed seven policemen and nine soldiers and captured three other soldiers on Saturday. With the tempo of the Afghan conflict steadily increasing, it was a bad few days for the Afghan government. The fighting has demonstrated that the insurgents have a capacity for carrying out ambitious operations on multiple fronts, while the government has struggled to respond on a single front in Ghazni. Are the Chinese Communist Party’s (very public) differences reconcilable? On Thursday, a top official at the People’s Bank of China published an article saying that the Finance Ministry has not done enough to improve the Chinese economy. On Friday, Beijing’s biggest mouthpiece, the People’s Daily, published an op-ed touting the success of Chinese President Xi Jinping’s sweeping deleveraging campaign – a critical reform for China, but one that some believe will be too painful to pursue once the trade war takes its toll. Most interesting, the People’s Daily published another piece taking aim at critics at home who argue that Beijing’s increasing assertiveness on several fronts – from the South China Sea to the economic realm – is at least partly to blame for the growing international backlash against China. Thousands of Hui people gathered at the towering Grand Mosque in Weizhou on Thursday and Friday to prevent authorities from demolishing the structure. A newspaper of the ruling Communist Party said Saturday that no religion is above the law in China, urging officials to stay firm while dealing with a rare protest over the planned demolition of a massive mosque in the northwest. The Global Times said that local officials in the town of Weizhou in Ningxia, a region that’s home to many ethnic minority Hui Muslims, must act against what it described as an illegal expansion of a religious building. China’s expanding line-up of multirole, all-weather J-16 fighter jets will help the air force to launch strikes deep into enemy territory and destroy key strategic assets like airfields and bridges, military analysts say. While it is not as advanced as the new J-20 – officially named Weilong, or powerful dragon – the Shenyang J-16 will become a key part of PLA Air Force operations and any strategy against Taiwan or to deter US military intervention, they said. China’s air force announced last week that a squadron of J-16s would soon be combat ready. Based on the Russian Sukhoi-30 fighter jet, the J-16 was introduced around 2012 to 2013 but did not make its official debut until a year ago, during a military parade marking the 90th anniversary of the People’s Liberation Army. Powered by a Chinese WS-10 Taihang turbofan engine, the fighter jet has been compared to the US F-15A/C Eagle. Iran has threatened to block access to the world's busiest oil route in response to U.S. sanctions designed to reduce the revolutionary Shiite Muslim power's petroleum exports to zero. While there has been no indication that Iran was prepared to go through with the warning, such a move would likely be catastrophic for the region and global energy prices. The first batch of U.S. sanctions on Iran came into effect Monday, following President Donald Trump's withdrawal in May from a 2015 landmark nuclear deal between the two countries, as well as five other major powers. These sanctions include restrictions on Iran's manufacturing, aviation and automobile industries, but the next round on November 4 will specifically prohibit international companies from doing business with the country's oil and gas sector. The administration wants a new military service branch, but space mission's future in the Pentagon and Congress is far from certain. The Trump administration officially rolled out its roadmap to create a U.S. Space Force, the first new military branch in over 70 years by 2020 — assuming Congress complies. Vice President Mike Pence unveiled a plan to ask Congress for the authority and funds to set up the U.S. Space Force as a sixth branch of the armed forces, calling the proposal “an idea whose time has come.” The Defense Department will kick into action a series of steps that it can take without Congress by the end of the year, including the creation of a new combatant command for space and new space war-fighting and weapons-buying units that will eventually become part of the Space Force. A draft of the plans were first reported by Defense One last week. Hosuk Lee-Makiyama is director of the European Centre for International Political Economy in Brussels and specializes in digital trade and East Asia diplomacy. Europe has often been hailed as a global leader when it comes to trade and privacy, particularly after its passage of the General Data Protection Regulation, the European Union’s privacy law, which came into effect in May. And while it is no doubt a worthwhile endeavor to protect European citizens from illicit online surveillance, the landmark bill comes at a cost: it is a form of digital protectionism. It was a verdict heard around the world. In a stunning blow to one of the world’s largest seed and chemical companies, jurors in San Francisco have told Monsanto it must pay $289m in damages to a man dying of cancer which he claims was caused by exposure to its herbicides. Monsanto, which became a unit of Bayer AG in June, has spent decades convincing consumers, farmers, politicians and regulators to ignore mounting evidence linking its glyphosate-based herbicides to cancer and other health problems. The company has employed a range of tactics – some drawn from the same playbook used by the tobacco industry in defending the safety of cigarettes – to suppress and manipulate scientific literature, harass journalists and scientists who did not parrot the company’s propaganda, and arm-twist and collude with regulators. Indeed, one of Monsanto’s lead defense attorneys in the San Francisco case was George Lombardi, whose resumé boasts of his work defending big tobacco. 5G is the ugly duckling of technology, yet it is the one that will radically change the world. According to the MIT Technology Review, 5G is a "technological paradigm shift, akin to the shift from the typewriter to the computer." While another reference to Moore's Law -- Gordon Moore's prediction that processing speeds would double about every 18 months at lower prices -- makes me want to heave, it remains true to form. 5G will represent the greatest leap in processing speed since computing began, and it's predicted that 5G will be a staggering twenty times faster than 4G. Our wired world is turning into a tangled web. Attempts to both exploit and regulate digital connectivity have revealed deeply rooted and distinctly different notions of where and how to draw the virtual boundaries of market access, citizen autonomy and privacy — even within the West. The sheer weight of China’s global economic gravity is pulling others into the invasive maw of its digital orbit. Japan sees the vaunted new privacy rules that challenge big tech’s abuses in Europe as online protectionism against its global companies. The well-meaning effort to debureaucratize the delivery of social services through biometric e-administration in India threatens to erase privacy instead. Google’s corporate vision of a smart city in Toronto has sparked a techlash by a local community that resists being digitally managed.